Bali Hotel Elephant Safari Park Lodge is located in the north Ubud, Elephant Safari Park. 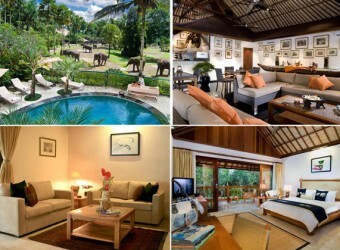 It is the only lodge that you can enjoy encounter with elephants, safari-style lodge. There are about 30 elephants living in the park, and they offer pick-up service by elephant to your room. It is the fun place for animal lovers and family.